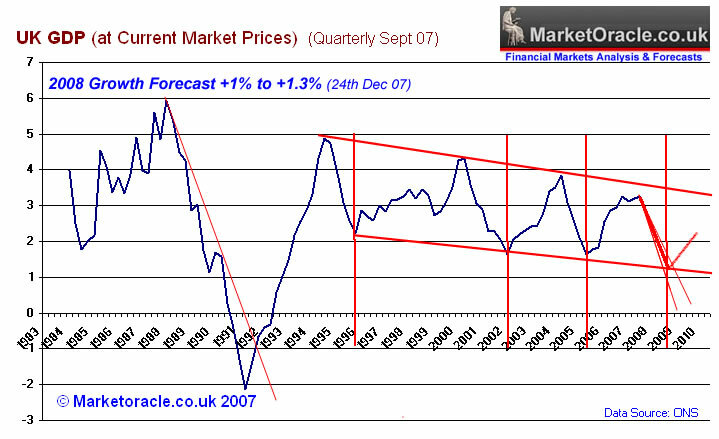 The Market Oracle forecast as of August 07 and Sept 07 is for UK interest rates to fall to 5% by September 2008, with interest rates about to reach 5.25% by February 08, would now suggest that the original 5% target could be breached by September 2008. However some economists suggesting much deeper rate cuts on par with the US cuts may be greatly disappointed as inflationary pressures persist which are further being exacerbated by a weakening British Pound that has fallen from a peak of $2.11 to $1.95 today. The forecast for UK GDP growth by the end of 2008 is for a an annualised growth rate of between 1% and 1.3%. Which suggests that despite much bad news on the economic front, the UK looks set to avoid a recession during 2008. The first half of the year will be much tougher in growth terms then the second half, which therefore suggests a pause in the rate cutting cycle as we move into the second half of 2008. As forecast in November 2007 - UK Inflation Forecast 2008 (RPI and CPI), the current up tick in inflation is expected to terminate in Jan 08, and the trend is expected to resume lower, forecasting a sharper fall for the RPI than the CPI. RPI is forecasting a trend towards 3% and the CPI is forecasting a trend towards 1.9% by September 2008. The anticipated trend in the UK's Money supply growth continues to moderate from the high levels of 14% plus towards a trend to below 10% as per the analysis of 18th Sept 07 . Money supply is an important contributory indicator for future inflation between 6 and 12 months forward. Hence money supply growth near 14% during mid 2007 was expected to result in higher inflation going into 2008 ( 22nd August 07 ). The conclusion is that the Bank of England will take the drop in M4 to below 10% as a better indicator of future inflation 2 years forward, and therefore continue cutting UK interest rates that are now targeting a move to 4.75% by September 2008.